Hey Los Angeles, was the air feeling a bit brisk to you lately? Well, no need to break out that light jacket, because by Thursday the city will be enveloped in a massive heat wave! According to the National Weather Service, LA will see high humidity and temperatures reaching 110 degrees the rest of this week. That means yes, you're definitely going to see your neighbor Jim's shirtless beer belly. 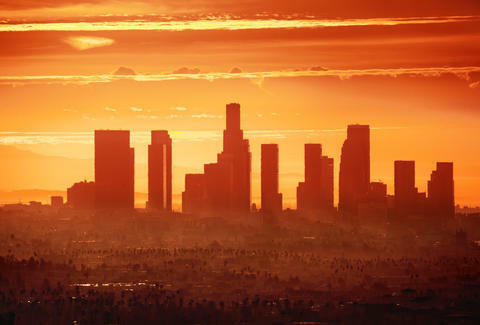 But not everyone will get the worst of it -- the LA Times reports that the hottest areas will be the traditionally scorching Woodland Hills and Burbank (where temperatures could reach 103 and 98 degrees by this weekend). Downtown LA will also be feeling above-average heat on Saturday and Sunday, with temperatures potentially reaching 91 degrees. The Times notes that these are not record-breaking numbers, but still above-average for the season, and a noticeable change from last week's cooler temperatures. Also, if you thought you'd be able to cool off in the ocean, think again. Last weekend, the Santa Monica Pier saw water temperature at an unseasonably high 74 degrees, while the water in Marina del Rey was 71. According to the National Weather Service, the water will only get warmer this week. Aren't you glad you never installed that hot tub? Additionally, with the impending heat comes the potential for fire in the drought-ridden mountains and hills. Though the humidity is not expected to be low enough to provoke wildfires, the drought and high winds may have the potential to turn small flames into dangerous fires. So, probably best to postpone showing off your new backyard fire pit for now. Stay cool, LA. And by that we mean, keep letting Dr. Dre take out skywriting ads. Lucy Meilus is a staff writer for Thrillist and thinks everyone should invest in a cooling gel pillow and call it a day. Follow her on Twitter for more great advice at @Lucymeilus and send news tips to news@thrillist.com.